Thought Starters provides me with a chance to review and highlight some of the more important or interesting research and opinions that I’ve read over the last week or so. This edition looks at venture capital, Uber’s valuation, mobile commerce, innovations in the telecom and the energy sector, social class and Brazil among other things. With Uber, you have a singular brand with a credible story. The question is whether that brand and that credibility, plus the other assets on Uber’s balance sheet, add up to $62.5 billion. Here is a business under siege by rivals big and Lilliputian, in the midst of a cannibalistic pricing race to the bottom, bleeding cash and losing money while battling well-heeled, technologically savvy incumbents displaying every intention of owning the space themselves. For the news industry, this huge economic gap carries two likely consequences: internet giants and digital native news outlets will have tremendous financial firepower to do whatever it takes in terms of marketing or their ability to go further into the general information segment (cf. Snapchat); and the network effect will apply even further when advertising dollars keep drying up for what will be increasingly seen as niche media. More broadly, except for the old, educated and affluent segment of the population, the vast majority will be informed by a rapid-fire of superficial and shallow contents spat by the social firehose. Expect more Brexit hurricanes and Trump floods in the future. Simon Hattenstone has taken a critical at meritocracy in the UK in light of Theresa May’s recent cabinet appointments which are less dominated by Etonians than her predecessor David Cameron. This raises the question will we see real change or more of the same? But the public’s understandable despair isn’t wholly shared by the experts I spoke with. Stepping back, they saw unlikely causes for hope. Impeachment revealed the worst about Brazilian democracy—and the worst wasn’t so terrible. There’s no talk of returning to dictatorship, no real fear of a Hugo Chávez–like figure clouding the sky. Impeachment was a poor showing of democracy, but it was still democracy. Even with all the budgetary turmoil, Bolsa Família remains firmly ensconced. Austerity will whack the poor, yet Lula’s evolution of Brazilian social democracy won’t reverse course. Most important, the Petrobras scandal is so spectacular that its grasp on the popular imagination doesn’t seem to be slipping. Indeed, Temer’s impeachment gambit has yet to slow the Moro investigation. Brazil has a once-in-a-generation chance to untether its politics from its debilitating state of codependence with the big firms. Hosting the Olympics was never going to bring Brazil the national greatness Lula advertised. Freeing its democracy and economy from the plague of corruption could. The featured image is a Gue mural photographed by Angelo Jaroszuk Bogasz at the Altrove Street Art Festival in Catanzaro, Italy and published in StreetArtNews. WeChat provides an interesting case study in how we might see the mobile ecosystem developing in the West with mobile messaging becoming a hub for an increasingly diverse range of services. Edith Yeung profiles some of the different services currently offered in China – we’re beginning to see this with Facebook Messenger’s expansion of functionality and there’ll no doubt be plenty more to come in the near future. “What I do believe, however, is that these new technologies are going to fundamentally change how we approach design. This is necessary to understand for those planning to have a career in tech. In a future where computers can see, talk, listen and reply to you, what good are your awesome pixel-perfect Sketch skills going to be? The featured image is Pistache, Bleu Gris et Noir by eko. I have recently taken on full time work on top of other commitments, so I’m finding my time to blog is less than I have had in the past. Find below content recently that has caught my attention. We’re very, very good at explaining why things won’t work. We’re not nearly as good at imagining creative new ways things might work. The regime may remain suspicious of the West, and drone on about seeding revolutions in oppressor countries, but the revolutionary fervour and drab conformism have gone. Iran is desperate to trade with whomever will buy its oil. Globalisation trumps puritanism even here. The featured image is GoddoG’s piece from the Festival K-live in Sète, France. Algorithms have the potential to surround ourselves with like minded people and information that supports our viewpoint in what some people call a filter bubble. Given these concerns, it is great to see innovations that bring together people with alternative views together. Hopefully we’ll see more of this in the future. Horace Dediu tracks the growing role of smartphones and tablets in online purchasing in the US drawing on the IBM Digital Analytics Benchmark study. 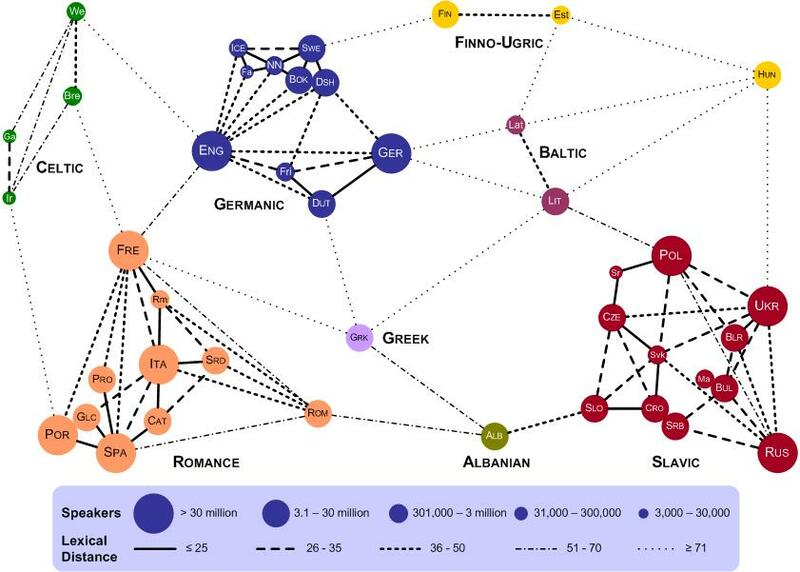 GlobalWebIndex provides a view on how PC, mobiles and tablets are used during the purchace process. 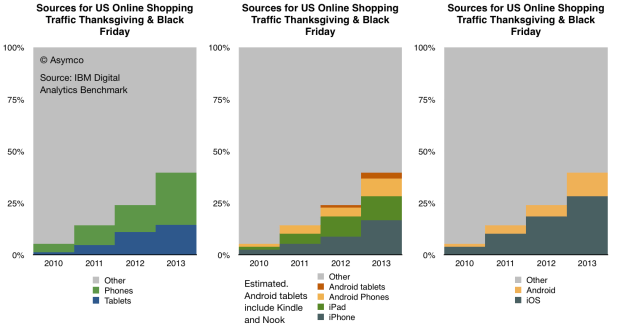 Ecommerce is not a PC monopoly particularly as we see PC sales decline. Ben Bajarin looks at the increasingly diverse world of Android ecosystems in which Google is a player but my no means the only beneficiary. Benedict Evans looks at the BBC figures for iPlayer which points to the online service making up a fraction of overall television viewership for now, although growing tablet penetration of tablets may see this change. Nicholas Carr in The Atlantic provides a thoughtful piece on some of the negative aspects associated with automation as we rely increasingly on machines. GlobalWebIndex give their view on what are the most used social services worldwide. Frank Chimero’s meditation on the role of the screen and interactive design is worth spending some time with. 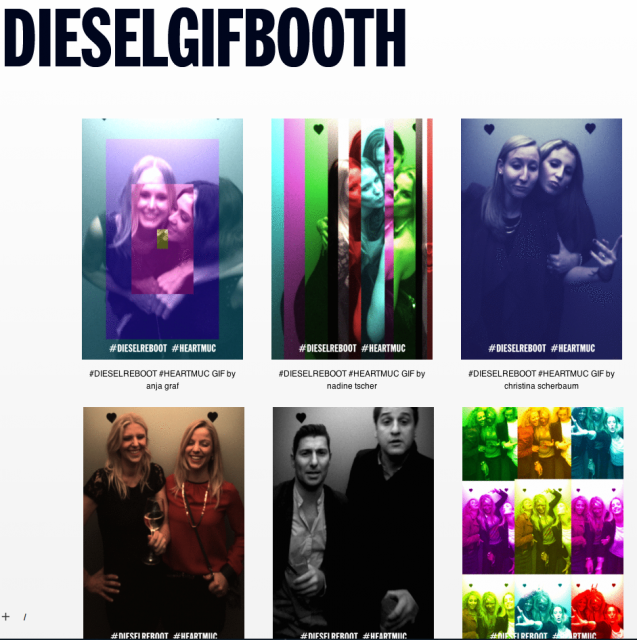 Diesel makes Tumblr friendly animated GIFs in its latest experiential campaign. Patagonia has long had a socially responsible image and has created a lot of noise with its recent calls for people to buy less. Worn Wear is the brand’s latest initiative celebrating the clothing that lasts you for years which it has supported with a short film contrasting its position with other retailers during Cyber Monday. The strategy has apparently been successful with growing sales for the outdoor brand. Gallery Analytics is an installation for exhibitions that’s able to generate data about behavior of visitors and present this data in a Google Analytics-like environment. 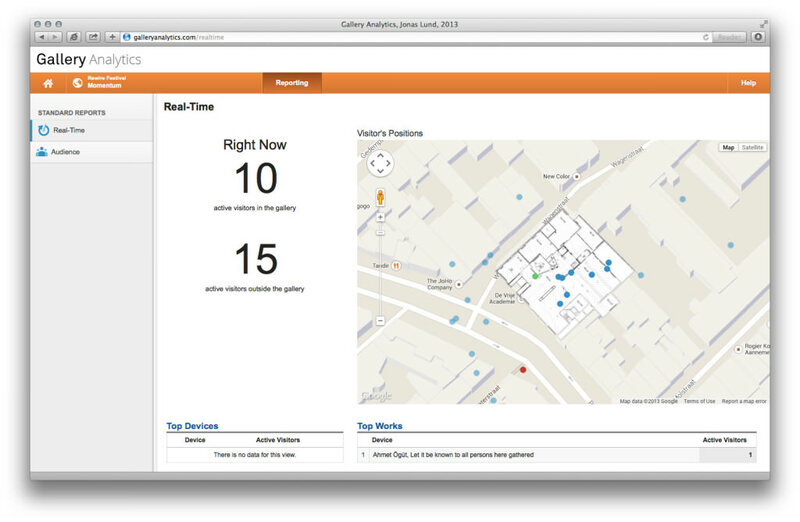 By setting up a mesh Wi-Fi network and combining it with custom-made software, Gallery Analytics is able to track every Wi-Fi-enabled device (such as a smartphone) moving around in the area in real-time. I can imagine we will see more of this kind of thing as iBeacon comes into play.